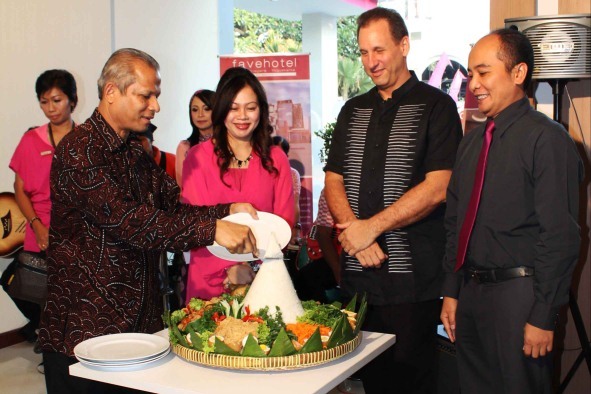 Jakarta, August 24th, 2012 – Aston International recently opened its first trendy select service favehotel in Yogyakarta by Mr. Tazbir Abdullah - Head of Yogyakarta Tourism Department, the favehotel Kusumanegara - Yogyakarta. The new “fave” enjoys one of the best locations in Yogyakarta and is no more than 5 minutes from Fort Vredeburg and the Yogya Expo Center making it equally interesting for tourists and business travelers..
With 101 fun, fresh and friendly rooms, Yogyakarta’s first fave aims to bring edgy design and unprecedented levels of service to the city’s budget hotel market and affords facilities and amenities usually associated with more costly hotels such as an attractive and contemporary hotel lobby, a stylish meeting rooms and an eclectic café. Guest rooms are equipped with 26 inch LCD televisions, top of the line beds with quality cotton bed linens and duvets, free and “truly” high speed Wi-Fi and a complete set of complimentary in room amenities such as fluffy cotton towels, bathroom amenities, individual controlled air-conditioning and save deposit boxes. Aston Internationals Vice President of Sales & Marketing, Mr. Norbert Vas, said: “Fuelled by Indonesia’s growing middle class and changing customer demographics demand for quality budget accommodations in Central Java is on the raise. Our 200 plus rooms fave in Solo for example, which opened only a few months ago, is now very well established and enjoys an almost cult status with young travelers. We are confident that the favehotel Kusumanegara, with its fave trademark design and service, will be equally well received”. Seen in the image, rice cone cutting by Mr. Tazbir Abdullah - Head of Yogyakarta Tourism Department as an official sign of favehotel Kusumanegara’s opening witnessed by (right to left) Mr. Wawan Eza Sukmawan - General Manager of favehotel Kusumanegara, Mr. Winston Hanes – Regional General Manager of Aston International and Mrs. Evi Yuliastuti – Owner of favehotel Kusumanegara. Seen in the image, ribbon cutting by Mrs. Evi Yuliastuti – Owner of favehotel Kusumanegara accompanied by (left to right) Mr. Winston Hanes – Regional General Manager of Aston International, Mr. Tazbir Abdullah – Head of Yogyakarta Tourism Department and Mr. Wawan Eza Sukmawan – General Manager favehotel Kusumanegara (far right).